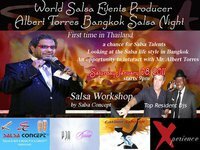 ALBERT TORRES the world’s premier producer of live Salsa Music and Dance events is visiting Thailand for the first time. On this occasion we are honored and excited to get together for a special and unique “Albert Torres Bangkok Welcome Salsa Party”. This is a rare opportunity to showcase Salsa Life style in Bangkok, to interact with him and to give the best, the warmest and the most memorable welcome Bangkok Salseros/as can of…fer such a leading figure of the Global Salsa Movement. It’s also an opportunity to get some Albert Torres original promotional CDs, DVDs and materials. Salseros from neighbouring countries, especially Hong Kong, Vietnam, Malaysia, Nepal, who can join, will be warmly welcomed. Originally from Puerto Rico, he grew up in New York and is now living in Los Angeles (California). First and foremost, Albert Torres has a burning passion for Salsa. He dedicated his life to the celebration and performance of Latin and Afro-Caribbean music and dance expressions. His continuous efforts for the globalization of Salsa have made a major impact on the recognition of Salsa Music and Salsa Dance around the world. He Founded Albert Torres Productions Inc. (ATP) in 1992. Since then, he created and co-produced more than three hundred and fifty spectacular Salsa Dance Events known as SALSA CONGRESSES in more than 50 countries and venues Worldwide. Albert Torres co-produced the famous World Salsa Championships. In 1998 Albert Torres Productions (ATP) has created and produced the world’s largest Salsa Music event, The West Coast Salsa Congress. He has the talent to transform the event’s location into an exciting music and dance venue that attracts thousands Latin Music enthusiasts from all over the world. As a Salsa artist, he has been a featured dancer and choreographer on various film and television projects such as MAMBO KINGS with ANTONIO BANDERAS and DANCE WITH ME with VANESSA WILLIAMS. In 1993, he was selected by DEBBIE ALLEN to be a featured dancer at the Academy Awards, and he also made a guest starring appearance on the KEENAN WAYANS SHOW where he performed with JENNIFER LOPEZ. Albert Torres Productions Inc. (ATP) continues to deliver high quality events with world class performers. His bands are legendary and his events feature some of the finest musicians and dancers the world has ever known. His latest “Baby” is THE WORLD LATIN DANCE CUP which featured spectacular dancers from over forty-one different countries in December 2010 in San Diego. His philosophy is embedded in the following mottos: “Dance for the World”; “Dancing without border”; “Dancing is a Way of Life”; “Dance from your heart”; “Let your feet dance”; “Creating unity through Salsa”. Let’s share our passion for salsa and Latin music and dance with Albert Torrres…Let’s party with Albert Torres in Bangkok! 10 to 12:00 Social dance with top resident DJs. 12:00 to 12:20 Albert Torres on the Stage – Awards, giveaways – note of thanks. Party continue till 1:30 AM.